Like NBA 2k8? Then you’re gonna love Isiah Thomas’ NBA 2K-Disgrace, you get to run a NBA Franchise and take them to mediocrity and then disgrace! Fire a hall of fame coach, 2 if you like! Trade everyone on your team-create complete chaos! Your star point guard walks off the team? No problem, as a matter of fact BONUS! Work your way up to the unlockable sexual harassment mode! 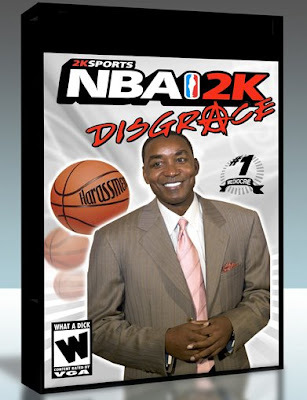 That’s Isiah Thomas’ NBA 2KDisgrace. The Knicks, a once proud basketball franchise (they play professional basketball in New York City- yes, there is technically professional basketball in New York City) reduced to an existence similar to that of that dude who was the King of Rohan in “The Lord of the Rings”, the one who was very old who had been betrayed by the person he trusted to advise him (Isiah), may be showing signs of returning to the living by hiring a dude who will fire Isiah Thomas (the William Krystal of the NBA) as soon as the season is over oh my god this is a long sentence. Is this the turning point in the battle for Middle Earth (Madison Square Garden)? I don’t know for sure, but one thing is clear- I saw Return Of The King last night on DVD. In closing, let me just say F Isiah. And thanks to the great Steve Thomas for the cool graphic.